For the first time in a few years, I got to go back to the Outlaw National Championship Motor Spectacular, which is basically Monster Trucks. They also have minibikes and tough truck races, which is the only reason we go. Rory was entered and in the first round he flipped his truck. They didn't think he would fix his truck in time for round 2, but after having a friend drive all the way home to get parts, he edged out everyone for a first place run. The 3rd round he did even better and won the whole event! After being sick so much last year, it was nice to go back to the Valley Days. The rides were worthless and the onion rings made me puke up grease all night, but the kids all had fun! There were some nice bands to listen to and Todd had the chance to eat from almost every single food vendor. Since mom moved, this was the first year to watch the airshow from somewhere other than poolside. We went over to a church and sat in their parking lot. The Candadian Snowbirds did a great job! Another faire at Jubilee and we were not disappointed. There were twice as many vendors this year with great selections of trinkets, jewelry, weapons, and garb. I took my neices as well as my brother and all had a fantastic time. Todd bought himself some medieval clothes and I have a feeling next year all the kids will want to go in costume as well. I bought a small knife/dagger thing and some cool dragons for Todd and I. For my birthday, Todd took me to Adventureland for the weekend. We left right after work on Saturday and drove 2 and a half hours to Des Moines. We wandered around most of the first day, looking at the shops and riding some of the rides. 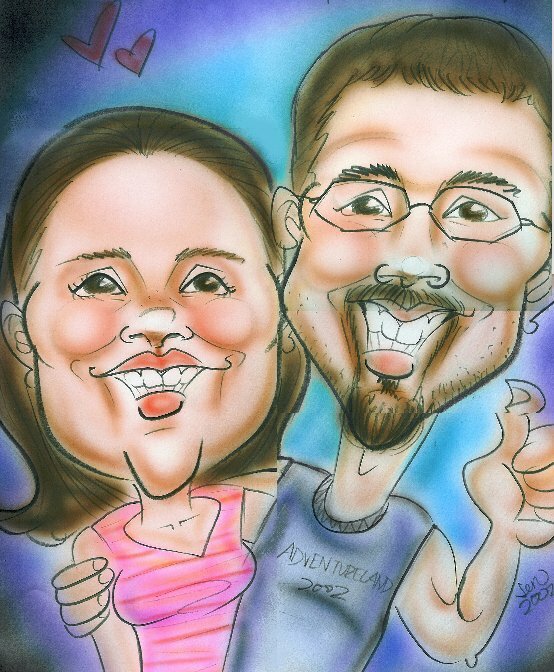 We rode a ferris wheel and the Raging River on Saturday, then got a characature done (again) before heading to the hotel. The room had a small patio overlooking the kids pool. On Sunday, we have a huge breakfast buffet before checking out and heading back to the park. The second day we went on the new ride, the Sawmill, and watched the Circus. I couldn't have asked for a more fun birthday! On July 4th, I woke up and went to the parade in East Moline. It was hot as hell and Josh got sick from the heat. Afterward, in the evening, we went to Amy's house for a cookout and to let of fireworks. We also celebrated my birthday and had a watergun fight with my birthday gift from mom!